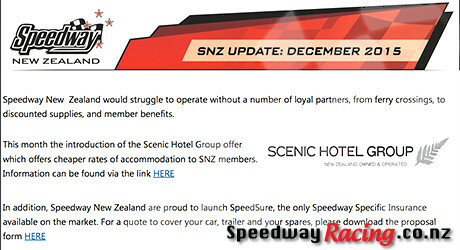 Speedway Racing New Zealand — Speedway Racing New Zealand for all things speedway including racing events calendar, driver profiles, crashes, pictures, videos, tracks, speedway ads, and more. Download the update here (PDF direct link). 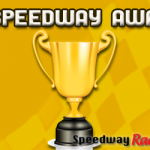 The results are slowly trickling in (we’ll update as received) – the winners of the New Zealand Speedway Awards for 2015 have been announced in Wellington on Saturday. 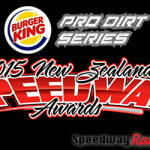 Well done to all those finalists, and a big congratulations to the winners of the 2015 Burger King Pro Dirt Series New Zealand Speedway Awards. For a national newspaper, radio, TV network which makes the best effort to support Speedway in New Zealand. For local newspapers, radio stations and local community broadcasters which makes the best effort to support Speedway in their community. For the best single written article published in a newspaper, website or souvenir programme etc. For the best Video/DVD/TV/Internet Production. To include the full race meeting or programme and not just a segment. To have been produced prior to 22 April 2015. For the most informative track website. For the most informative speedway website. For the most entertaining and accurately informative track announcer (one person, not a commentary team). The photographer who has excelled via their camera work during the 2014/15 season. For the best single speedway photo taken during the 2014/15 season. Covers all Speedway NZ Officials (Referees, Stewards, Scrutineers, Senior Referees, Stipendiary Stewards and Technical Stewards). Technical advancement, promotional idea or anything new that continues to move the sport forward. This includes all Speedway NZ Allocated titles only (NZ, GP, NI, SI). Teams events are now included in the category below. Any race meeting other than Speedway NZ allocated titles (now includes teams events). Criteria includes: competitor growth, facility improvement, race meeting quality, field sizes etc. For the venue that makes the best effort to promote Speedway. For a SINGLE speedway vehicle that is well-presented. This category no longer includes the presentation of the crew or tow vehicle. For a MULTI car team that is best presented including race vehicles, drivers and crews. For the best first season driver to a National Speedway class as of 1/9/2014. Competitors may have previously raced in youth, regional or local classes, but not other national classes. 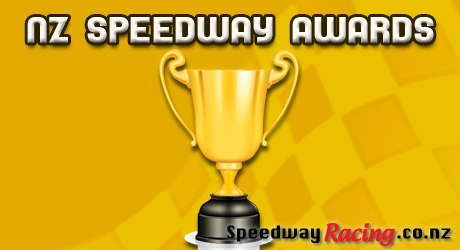 For the driver who has not only achieved accolades but who has helped fellow competitors, Speedway in general, contributed to their Club and overall true sports person. 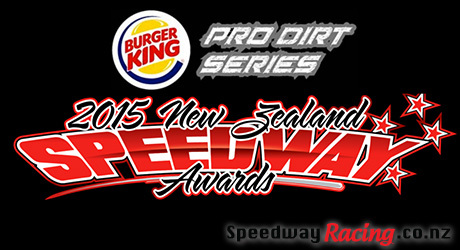 The category is judged by the Speedway NZ Board and the trophy is presented by Speedway NZ.